Barring any major bugs, this will probably be the final (Windows) sneak-peek before the next official release. @Anthony,thank you!!! you are on fire now! lol,love the consistent updating. I completely uninstalled and then reinstalled both the game and VCC’s 2020 campaign. It’s working fine now, made my way through the whole campaign with no errors. All heil our next President, Mitch Landrieu. For some reason after running a simulated campaign the game will crash with an access violation error. Before the update, I played a 2004 game as Howard Dean and, having won Iowa and New Hampshire, the following primaries started seeing massive (ie, plus +25 points) swings of undecided towards Joe Lieberman on each primary day, mostly resulting in him suddenly winning the primary from a base of about 2% in each state. Lieberman got a boost in this round of polling having just won Maine, Michigan and Washington the weekend before and AZ, NM, DE, MO and ND (all shock results according to previous polls) the week prior. Now, this was public polling and polls can be wrong and the margin of error in the game is always good fun, however this feels more than a little unrealistic, for a candidate to jump from last to first and suddenly add upwards of 25% to their polls in the space of a day. This is exciting! Can’t wait to download tonight. Thank you for including endorsers withdrawing endorsements, I think that might make races more interesting. Will there be a negative news story associated when that happens? It sounds like there is a memory leak somewhere – this bug is now my top priority. Note: now available for Mac. Tough for me to say. It looks like undecideds were breaking heavily for Lieberman (+31% undecided in latest poll). How long was it between the latest poll and the VA primary? Thanks for the feedback! Yes, there’s a news story when an endorser unendorses. Thanks for this feedback – I’ll attempt to recreate this bug. The polls were on the Monday, primary on the Tuesday. I get the point about the undecideds, I just question why they’re breaking so heavily for one candidate who starts at such a low base. It’s not just the later primaries either, even in Iowa Lieberman came up from about 2% to finish in second with ~22%. It’s hard even for a player to sweep up that many undecideds so it just seems odd for the AI. @Will, I agree that seems like a lot of undecideds breaking for in this case Lieberman like that. I’ll keep an eye out for these sorts of dynamics. My best guess is that this is caused by the regular increase in memory due to party polling data in the game. For example, 5 parties was increasing memory usage by more than 10 MB per turn. If you start early enough, this will use up all the available memory on some systems. Workaround is to play with fewer parties. The polling system is set to be replaced with the Winter 2019 cycle. Until then, I will look at options to reduce memory usage re polling data. On an unrelated note, I have found that it’s best to turn polls off. They seem to have an enormous effect on the initial party percentages. If I put a national poll that shows A over B 55% to 45%, then the game upon starting, will set EVERY state to be A over B by roughly that amount. It just seems that setting one poll drastically affects the game, and it’s not even clear how that happens. I’ll set a poll date for March 1, yet when I start a game January 1, the effects are still seen that far back. So hopefully these quirks are being addressed in the new polling system. The primary is impossible to play without it crashing. I keep getting errors that it can’t autosave and then a few turns afterwards, the game itself freezes up. When I try to load the game file it gives an “unable to read from specific game file” error. This was also occurring when I played a few months back before all the changes. It’s really frustrating doing months of campaigning and then the game crashing without being able to load it again. Please look into this. You are probably running out of memory. I am working on this right now. 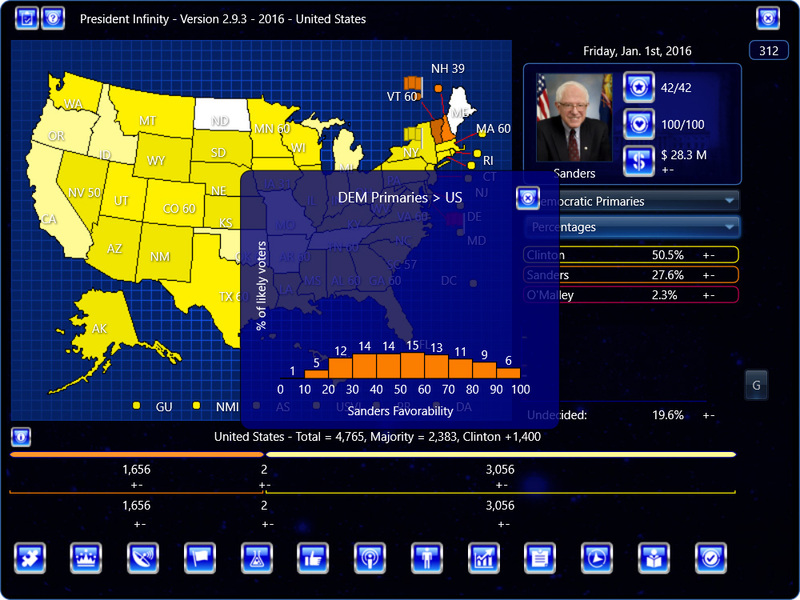 Workaround for now: play primaries with fewer parties and candidates, and with a date that is closer to the primaries. The new polling system is the in-game polling, not the polls used to set up %s for campaign designers. For this, I would have to look at exactly what you’re doing. If you only have 1 poll, and it’s a national one, then the game engine will use that for every region, because it has nothing else to go on. Similarly for dates – if all you have is a poll for March 1st, then for a start date of January 1st the game will use that as the starting point. This sneak peak is really developing well. The primary importance update works really well. Ok, so back on the polls topic, I’m confused when we go into “regions” and set party percentages for a specific region, what exactly are we setting? Are these the percentage of voters who lean toward a particular candidate? In the absence of polling data, does this inform the base polling percentages at the beginning of a game? I think in my comment about one poll making the entire map for the result of that poll, I was thinking that the entire percentages wouldn’t just be set by that poll, that the percentage by region would factor into that somehow. Limit is 128 candidates, I believe. Regions > %s and Polls > %s are 2 separate systems, except for the undecided-leaning-committed %s, which are set in Regions and used regardless. If you are using Polls > %s, Regions > %s for the actual party %s (not the breakdown undecided-leaning-committed) will be ignored.